Use the "Direction" field to specify the direction to be configured. Once it is specified, you will see what character replacement rules that are already set for this direction in the "Current translations" field. To define a rule, you should select the character code in the "Character" field and select the rule after that. • Replace with – the selected character will be replaced with the one specified. 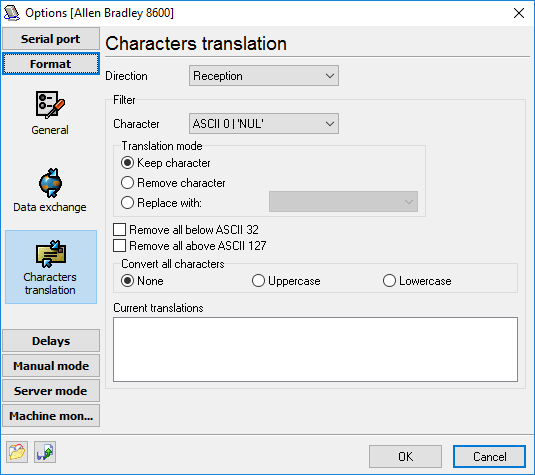 Removing all below ASCII 32 – all characters with a code less than 32 will be removed. It means all unprintable characters. Removing all above ASCII 127 – all characters with a code greater than 127 will be removed. It means all characters with the code requiring 8 bits of data.